I expected to come to Russia, learn a lot of math, and have a great time. Expectations were confirmed. The intensive mathematical study, however, proved to be far-and-above the dominant component. This semester was intensive, difficult, serious, disciplined and highly rewarding, This was mathematical boot camp. There’s no better description. I was able, however, in retrospect, to take many solitary explorations through Moscow and elsewhere. My Russian became fairly fluent. I gained cultural exposure. The non-mathematical experiences too, while less frequent, were also highly rewarding. I very much enjoyed the Math in Moscow program – the mathematics courses were very interesting and well-taught, and the opportunities to explore Moscow and its environs were amazing. Advice to future students: Learn so much Russian as you can – it is a lot of fun and make the rest of your life here more fun the more you pick up. I agree with Alex – learn ALL (or as much as possible in 3.5 months) the Russian ! Enjoy the math, enjoy the culture, eat borsch everyday, and travel everywhere that you can. Live in the Now – No Opportunity Wasted ! 🙂 Have fun in the program and don’t give up during those rough times. I had a great experience here at Moscow. Everyone in the program lives very close to each other (on the same floor) which makes it very easy to communicate with everyone and enables me to know everyone very closely. The math here is very intensive. Professors usually don’t restrict the material within the scheduled content, it can go beyond what you expected, which enables me to know much more than what I assumed. I’ll recommend this program to anyone who likes math and different experiences. Math in Moscow was awesome ! The level of math instruction was really top-notch, and I especially appreciated the small class sizes that allowed for a close, personable relationship with the professors. I never felt any hesitation when I wanted to ask for clarification on a definition or proof that I didn’t understand quite well enough. Apart from the mathematics, spending a semester here was a great cultural experience. I strongly recommend going on the trips to St. Petersburg and Vladimir and Suzdal, and learning as much Russian as you can. P.S. Remember, Без муки, нет науки. This is one of the greatest experiences I have ever had in my life. If you love math and want to learn more about it, you absolutely need to come here. Be aware, the courses are very intense and difficult. I really enjoyed my experience in Math in Moscow program. The professors have an infectious love of math, and made it alive through their teaching. If you want to do a lot of math, this is a great program. 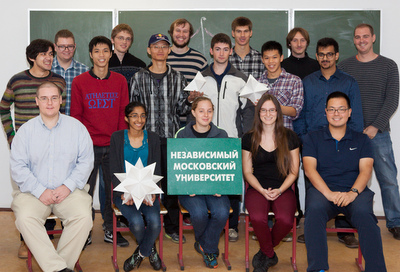 My semester in Math in Moscow was absolutely amazing experience both mathematically and culturally. The breadth of the courses was great and I got to see many topics here that I wouldn’t have been able to see back home. The professors here all truly want to teach these courses and are quite approachable. As a city, Moscow is huge and there are lot of things to do and explore. That will surely fill in the non-math time. Overall, I’m incredibly pleased with my experience here ! Most of my time this semester was consumed by math and ultimate frisbee, and I’m very happy with that. On the math side, I took three classes and did an independent study. Class sizes are extremely small; in one I was the only student. It makes it a really unique experience that I would recommend to anyone. Through ultimate frisbee I was able to meet and to converse with a lot of Russians, which was great for my Russian. I came to the program having studied Russian for 2 years. If you are like me, and are looking to improve your Russian while at this program I would recommend being active in seeking on opportunities to speak Russian before you become consumed by math. All in all I learned a lot of math and a lot of Russian which was my goal.